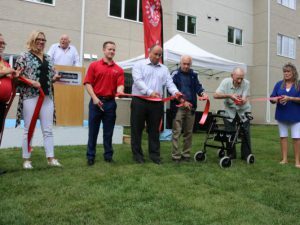 Chesterfield Housing in conjunction with All Saints Kinsmen celebrated the grand opening of their latest housing project on Saturday, August 26. Kinsmen Place, located on Chesterfield Avenue in Winnipeg, is a 45 unit building dedicated to providing affordable housing for seniors. Taking part in the ribbon cutting ceremonies were Dave Roberts, Kinsmen District 2 Governor, All Saints Kinsmen President Wayne Bakos, the youngest member of the All Saints Kinsmen, Cody Young and former members, Graham Ross and Henry Thoroski. Also assisting were MLA Rochelle Squires and former MP Shelly Glover. A noteworthy feature of the project is that it was constructed without any government funding, testimony itself to the efforts made by the All Saints Kinsmen to raise the necessary funds.